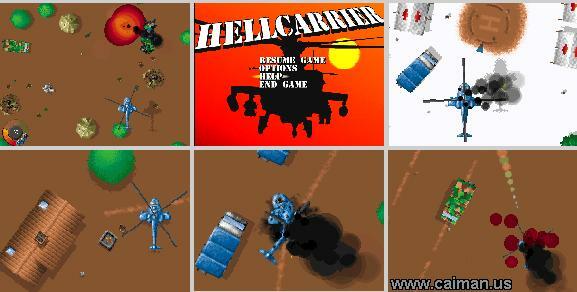 Caiman free games: HellCarrier by Johan Peitz. HellCarrier is a 2d, top down helicopter game. As a UN pilot your main objective is simple: To shoot terrorists. You are flying the worlds most sophisticated helicopter. It is equipped with mission/map screen, smart radar, armour meter and message indicator. At the beginning of the game you choose yor co-pilot and then it is off to battle with 4 standard missles and 500 rounds of machine gun ammo. During the various missions you will find around the battle field, crates of spare parts to repair your helicopter and you will also find more weaponry including: heat seeking and phosphor missles as well as standard missles and of course machine gun ammo. 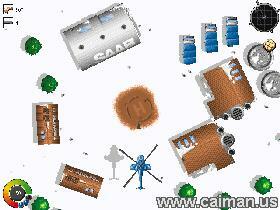 A second campaign which can be loaded from the main menu, takes place in the arctic region near the north pole. The terrorists have taken Santa Claus hostage and your mission it to rescue him. 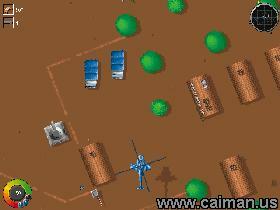 This game has life like sound effects and music, keyboard or joystick control, 3 levels of dificulty: easy, normal and hard and for slower computer systems; various video aspects can be changed to enhance playability. Source Code and Data .